Shenyang Imperial Palace (沈阳故宫), built between 1625 and 1636, is the former imperial palace of the early Qing Dynasty (1644-1911). It is located in the downtown Shenhe District of Shenyang in northeastern China's Liaoning Province. The palace and the Forbidden City in Beijing are the only two existing imperial palaces in China. In 2004, it was included in the UNESCO's World Cultural Heritage List as an extension of the Imperial Palaces of the Ming and Qing Dynasties in China. Though much smaller than the Forbidden City, the 70,000-square-meter architectural complex is the world's only imperial palace featuring the typical Manchu style, popular among tourists for its well-preserved unique buildings, precious historical relics and valuable artworks on display. The palace incorporates the eastern, central and western sections. 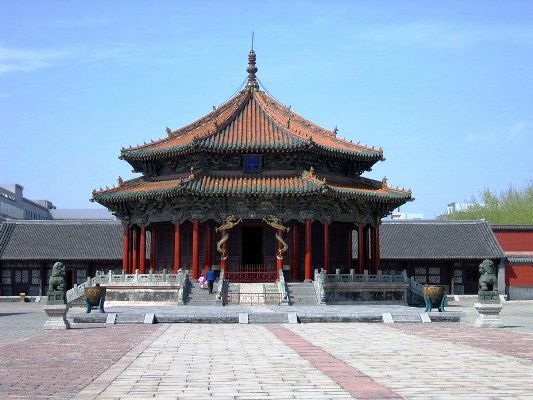 The eastern section houses the magnificent Hall of Grand Politics (Dazheng Dian) and the Ten Kings Pavilion. The central section contains such major buildings as the Daqing Gate, Chongzheng Hall, Phoenix Tower and Qingning Palace. The western section includes the main building-Wensu Pavilion, the Opera Stage, Jiayin Hall and Yangxi Room. 1. The best time to visit the palace is from April to October. 2. There is a royal etiquette performance from 2:00 p.m. to 3:30 p.m. every Saturday.